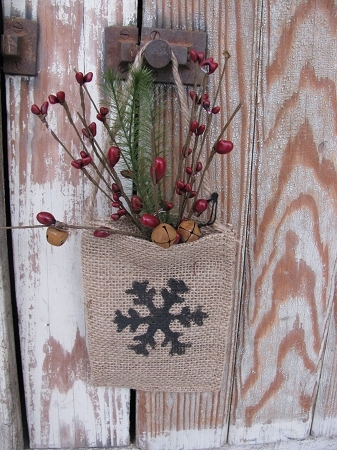 Primitive Burlap Hand Painted Snowflake Hanging Pocket with pine greenery and Berries. Choice of colored berries while supplies last. 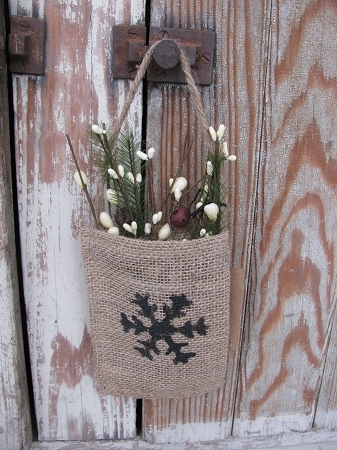 I've taken this burlap pocket and painted on a snowflake in Black. Used jute twine to hang the pockets by. The pockets were filled with feather tree pine greenery with berries and jingle bells. Chocie of burgundy berries or Cream, while supplies last.